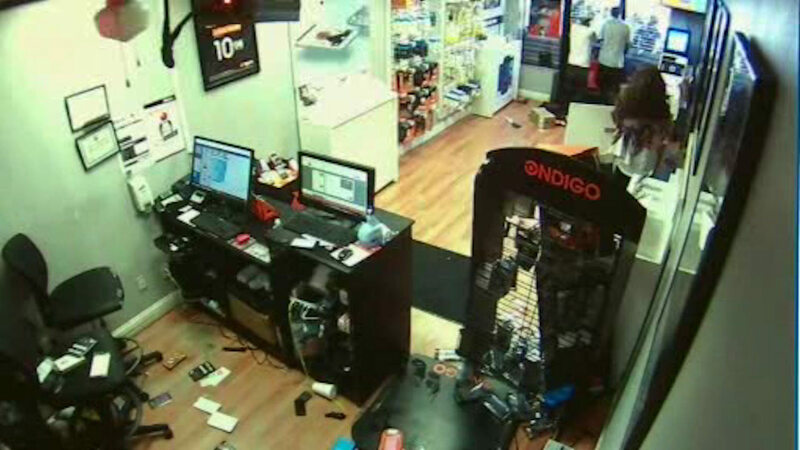 PATERSON, New Jersey (WABC) -- Two alleged armed robbers who were outsmarted and temporarily trapped inside a New Jersey cell phone store by a store clerk last Wednesday have been located and arrested. Paterson police announced on Wednesday the arrests of 50-year-old Samuel Labbo and 43-year-old Travis Davis on charges of robbing a Boost Mobile store in Paterson. Eyewitness News reported on the robbery, which took place on August 17th. Police say that shortly after 4 p.m., the two men entered the store with a handgun and held the manager Tommy Torres at gunpoint. As they began to loot the store, Torres managed to escape out the back door, lock it, and then proceed to run to the front of the business and pull down the security gate, authorities said. The suspects were trapped inside the store for more than 20 minutes, but were ultimately able to unbolt a metal cage over a side window and escape before police arrived. Internal Affairs is still looking into what caused the lengthy response time. In addition to being charged with robbery, Labbo and Davis are charged with possession of a weapon for an unlawful purpose, and unlawful possession of a weapon.